Many Minnesotans remember the heyday of the smelt in the 1960s and 70s, when Lake Superior’s smelt population peaked and thousands of netters could haul home buckets of fish. Although still popular among a few avid folks, this spring activity is no longer the big carnival-like event it once was. Smelt numbers have declined significantly from peak abundance in the 1970s because of predation by an increasing lake trout population and the establishment of Pacific salmon, interactions with lake herring, and the usual decline that is typical after the initial boom of an invading exotic species. With Lake Superior restored to a more natural state, we are unlikely to experience a resurgence of smelt to the levels that anglers recall from the 1960s and 70s. There is still a smelt run in most years, but it is minor compared to the smelt runs of the past. 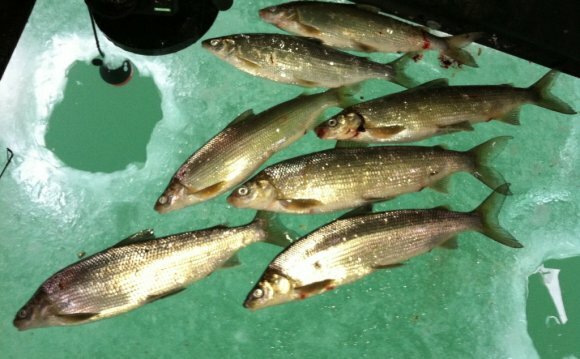 Rainbow smelt, silver-colored fish about 6 to 9 inches long, are an exotic species to Lake Superior. Native to the Atlantic and Pacific oceans, smelt entered the Great Lakes accidentally in 1912 when they escaped from an inland lake in Michigan where they had been stocked as forage fish. Smelt quickly spread throughout Lake Michigan and were first discovered in Lake Superior in 1946. By the time smelt arrived in Lake Superior, sea lamprey had begun reducing the number of native lake trout, and with far fewer lake trout to eat them, smelt rapidly increased in number. Over the last 30 years, effective sea lamprey control and harvest restrictions have allowed lake trout recovery, which along with the establishment of Pacific salmon have dramatically increased predation on smelt, reducing smelt abundance. Smelt generally enter streams in mid to late April when the water in the tributaries warms into the upper 40 degree F range. Smelt are light sensitive and run in shallow water at night, so most smelting takes place at night, when the fish are moving into the streams. Smelt can rarely jump over the first set of rapids upstream from the mouth, which is why the best netting is usually near the lake. The equipment is simple: a pair of hip boots or waders, a 1ong-handled net, and a bucket for the netted fish. Wade into the stream near the mouth and sweep your net through water behind riffles, boulders, or anything else that blocks the current and gives smelt a place to rest as they try to swim upstream. Some people also pull a seine net for smelt along the beach at Park Point in Duluth. A few of the most popular smelting rivers, moving northeast from Duluth, are the Lester, Knife, Stewart, Gooseberry, Split Rock, Beaver, Baptism, Cross, Temperance, Poplar and Cascade. The following streams are closed to smelting: French, Sucker, Little Sucker, Silver, Encampment and Crow. You may not use a flashlight, or other artificial light to locate or attract smelt. You must kill your smelt at the stream. It is unlawful to transport or possess live smelt. This is to prevent the spread of disease and smelt introduction to inland waters. Any fish netted other than smelt must immediately be returned to the water. Dip nets or seines may not be more that 25 feet long or 4 feet deep. Camping is allowed only in approved areas. Fires are allowed only in approved fire rings. All litter and trash must be disposed of properly. Many areas along the North Shore are privately owned. Unless the DNR has purchased an access easement from the landowner, it is unlawful to trespass on privately owned lake or stream shorelines without permission. When smelting in streams running through state parks, you must abide by the specific rules and regulations for state parks. Check with local authorities for additional information and restrictions.